Charles Elwood "Chuck" Yeager (born February 13, 1923 in Myra, WV) is a retired brigadier general in the United States Air Force and noted test pilot. In 1947, he became the first pilot to (officially) fly faster than the speed of sound. Yeager's career began in World War II as a private in the United States Army Air Forces. After serving as an aircraft mechanic, in September 1942 he entered pilot training and upon graduation was promoted to the rank of flight officer and became a P-51 Mustang fighter pilot. In 1944, Yeager was shot down over France on his eighth mission of the war. He escaped to Spain with the help of the Maquis resistance fighters. Due to a regulation that forbade "evaders" (escaped pilots) from continuing to fly over enemy territory due to concerns of re-capture and the possibility of compromising resistance groups. Yeager and another evader, bomber pilot Captain Fred Glover, personally appealed to General Dwight D. Eisenhower, the Supreme Allied Commander, to have their combat flying status restored. After regaining his combat status, Yeager continued to demonstrate outstanding flying skills and combat leadership. On October 12, 1944, he became the first pilot in his group to make "ace in a day", shooting down five enemy aircraft in a single mission. He finished the war with 11.5 official victories, including one of the first air-to-air victories over a jet fighter (a German Messerschmitt Me 262). After the war, Yeager became a test pilot of many types of aircraft including experimental rocket-powered aircraft. He became the first human to break the sound barrier when on October 14, 1947, he flew the experimental Bell X-1 at Mach 1 at an altitude of 45,000 ft (13,700 m). The X-1, which Yeager had christened Glamorous Glennis, bad been launched from the bomb bay of a specially modified B-29 bomber. Yeager later commanded fighter squadrons and wings in Germany and in Southeast Asia during the Vietnam War. In recognition of outstanding performance ratings while commanding fighter squadrons and wings, he then was promoted to brigadier general in 1969 and was assigned as the vice-commander of the Seventeenth Air Force. He retired from the Air Force in 1975, although he continued to fly occasionally for the USAF and NASA as a consulting test pilot. 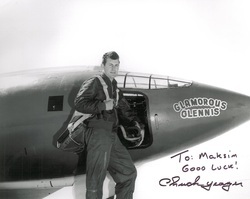 Photograph in my collection is autographed by Chuck Yeager, and bears the inscription "To Maksim, Good Luck! ".